Hired to find a client’s missing daughter, down-and-out private eye Maiku Hama travels to a creepy countryside retreat and ends up getting more than he bargained for in this excellent metaphysical detective story. Alternatively humorous and haunting, A Forest with No Name is anything but a typical mystery. Take an American hardboiled detective story, cross it with a bit of Haruki Murakami’s Norwegian Wood and Wild Sheep Chase, add a dash of Kiyoshi Kurosawa’s Charisma (1999) and the classic TV series The Prisoner, and you’ll have some idea of the overall tone and feel of A Forest with No Name, a quirky, humorous, and thought-provoking film from director Shinji Aoyama. Created as an episode of Yomiuri TV’s Shiritsu Tantei Hama Maiku series and then expanded to theatrical length for foreign release, A Forest with No Name centers on private eye Maiku Hama, a character undoubtedly inspired by Mickey Spillane’s famous tough-as-nails gumshoe, Mike Hammer. But Maiku is no prototypical hardboiled male. Previously appearing in a trilogy of films helmed by director Kaizo Hayashi, Maiku Hama looks a little different this time. 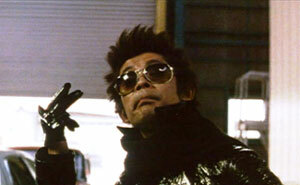 Although still wonderfully portrayed by Masatoshi Nagase, our detective hero comes across less as a straight-ahead film noir homage (as he did in The Most Terrible Time in My Life, Stairway to the Distant Past, and The Trap) and more like he’s supposed to be the frontman for a 70’s era glam rock band. This Maiku Hama looks more at home hanging with David Bowie than he would with Sam Spade or Philip Marlowe. The plot goes into motion when Maiku accepts a wealthy industrialist (Yoshio Harada) as a client. It seems that the man’s daughter (a young Rinko Kikuchi) is supposed to marry into a rich family, but she had other ideas about her planned nuptials and decided to run away. In an attempt to “find herself,” the young woman checks into a remote countryside retreat that promises to resolve all her personal issues. But as the saying goes, if it’s too good to be true, it probably is. With the help of a borrowed car, Maiku drives out to the woodland compound to investigate. Pretending to be a new patient, Maiku has a hard time blending in, as his eye-popping wardrobe - not to mention his belligerent attitude - make him a tad conspicuous. Of course, it’s easy to stick out if everyone else at the clinic looks like sedated drones with about as much personality as a rock. Their status as drones may actually be by design, however, as none of the patients are allowed to use proper nouns. The headmaster has even gone so far as to assign each person a different number in place of their given names. The more Maiku investigates, the more the place seems like a cult. While trying to convince the wayward daughter to return home, Maiku finds himself drawn to two other women at the facility. One of these women, a suicidal patient known only as Number 29 (Nene Otsuka) suddenly takes an interest in Maiku and wishes to leave with him. The other woman who captures Maiku’s attention is none other than the facility’s headmaster, the Doctor (Kyoka Suzuki). Although she’s soft-spoken and friendly, there’s something slightly unsettling about her. When she tells Maiku that there’s a tree deep in the forest that resembles him, one can’t help but question her motives. The next morning, Maiku follows her out in search of this curious tree…with strange results. A Forest with No Name maintains a delicate balance between its slightly tongue-in-cheek attempt at a detective story and its more self-consciously philosophical designs. Although use of music and the style of editing contribute greatly to this balancing act, it’s the pitch-perfect performance of Masatoshi Nagase that anchors the film. He may look ridiculous, but there’s some weight to the performance, and that pays off in spades in the latter portion of the film. In the end, the film turns out to be less of a straightforward detective story and more of a metaphysical one. The genre’s formulaic conventions are subverted and any sense of closure is elided, as questions are left open and unresolved. This approach is all-too apparent in the final moments of the film, which leave a great deal open to interpretation. Such an ending is likely to provoke a myriad of reactions, ranging from admiration for how “deep” the film is to bitter complaints about it being pretentious and unnecessarily opaque. My reaction falls closer to the former than the latter. Despite the fact that there remains much humor to be enjoyed in this reworked “fish out of water” tale, the film ultimately leaves the audience member with a haunting, slightly unsettling feeling. Notes:  All twelve episodes of the series were directed by different filmmakers, including Alex Cox (Repo Man, Sid and Nancy), Sogo Ishii (Electric Dragon 80.000 V), Shinobu Yaguchi (Waterboys, Swing Girls), and Isao Yukisada (Go, Crying Out Love in the Center of the World).